If you're ever sitting across from a person in any kind of a negotiation, sales, interrogation, cross-examination setting, etc., and he displays this same body language as Donald Trump is in this image - then he's showing you see his cards. The specific position of the President's hand is indicative of critical evaluation. Mr. Trump does not like what he is seeing and/or hearing. Additionally, Trump's torso, head and eyes are not facing directly at the person to whom he's looking/listening/speaking - rather these are all oriented obliquely. We don't look directly at those whom we don't respect, don't trust or don't like. Yet the most crucial nonverbal tell in this image is revealed by the President's lips. 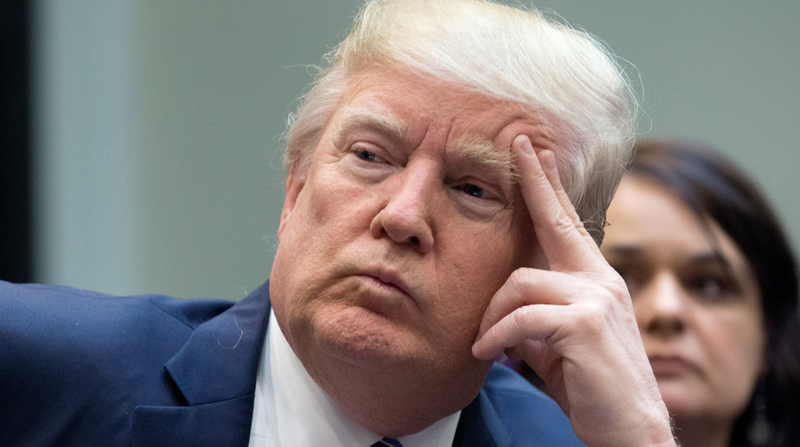 In this moment, Donald Trump's expression displays an excellent example of what is known as a "Forward Lip Purse" - and it's also one of the most information-dense nonverbal signals. Anytime a forward lip purse is made, the person displaying it believes that they are the alpha relative to those with whom they're interacting. Said another way, they perceive everyone else as a relative beta. The forward lip purse is also a signal that they either have a clandestine disagreement and/or a clandestine plan. Those who make the forward lip purse are usually voicing no disagreement or a very minimal one - yet they are thinking in terms of tremendous disagreements. Thus this is a profoundly valuable signal of a large disparity between what is thought and what is spoken. Moreover, because they are in an alpha mental-emotional alpha, those displaying a forward lip purse also believe that they have a high chance of success, once their plan in implemented.